If you know a thing or two about filmmaking or photography, you understand that Monopods and Tripods are difficult to compare. It’s like comparing a bicycle to a car. Both are very useful devices in specific situations, and both are essential parts of any film arsenal. Today we are going to be breaking down all of the pros and cons of a Monopod Vs Tripod. Later, we will discuss which device is more applicable to different content creators so you can truly understand which each tool is designed for. We will be looking at several alternative stabilization devices as well, because stabilizing your footage is not a black and white issue that there are only two solutions for. Let’s get right into it. 2.1 Monopod or Tripod For Vlogs? 2.2 Monopod or Tripod For Make-up Gurus? 2.3 Monopod vs Tripod For Filmmakers? 3 Monopod Vs Tripod – What About For Photographers? A Monopod, sometimes referred to as a Unipod, is a single pole used to stabilize a camera or other recording device. It is an effective support, and sacrifices stability for portability and simplicity when compared to a tripod. Monopods are geared towards run-and-gun productions or photographers looking to quickly capture fleeting moments. Quick and easy to set up. This is not just convenient, but sometimes necessary when trying to quickly capture a moment. Lightweight to carry on long shoots or hikes. Discrete, Some can even double as a walking stick! Can be used to extend your range and get your camera closer to things you don’t want to be next to. It’s like a go-pro pole for larger cameras. Can’t stand on its own without your support. This also means you won’t be able to film yourself if you’re looking to shoot stuff without a camera operator. Or takes long exposure / time lapse photography. Requires a delicate touch to keep stable. Not as good for smooth motion, as the monopod is able to tilt in any direction based on how you hold it. Can’t be used for stabilization in low light or for time lapse/long exposure photography. It’s unlikely that you are not familiar with the Tripod. A tripod is a simple three-legged stabilization device that uses adjustable legs to support your camera on any surface. It’s a more heavy duty solution, but if you need your camera to remain absolutely still for an extended period of time, it’s your only choice. The tripod is great for low-light shooting, self-shooting, and is necessary for nearly every single non-handheld shot in a narrative film. Required for stationary video footage lasting longer than a couple seconds. Absolutely necessary if you are gathering equipment for an indie film. Much stronger option for smooth pans and tilts. Most tripods feature a bubble so you can make sure you’re level to the ground before shooting. Heavy, can be difficult and awkward to move around, especially with the larger models. Using a tripod in public can get you in trouble. Often times you will be able to get away with shooting in public without a permit if you’re handheld or even with a monopod. A large tripod will make you stick out like a sore thumb. Require an amount of setup before they can be used. This means if a rare bird is flying by really fast and you need to quick-draw your equipment to take a shot, you might want a monopod. Now that we’ve discussed the pros and cons, we’re going to take an in-depth look at all the different types of content creators to find out which stabilization tool is best for each of them. You’ll find out if you should buy a monopod or a tripod, but we will also be informing you of lesser-known, alternative, niche stabilization options that may be the best choice for you. Monopod or Tripod For Vlogs? When it comes to Vlogging, typically the main feature of each video is you, the content creator. Because of this, a Monopod is not an effective stabilization option, because you wont be able to hold it up and film yourself at the same time. You’ll want to go with either a tripod, however, there is a better option. Many vloggers opt for a miniature-sized solution that’s right in between the two. 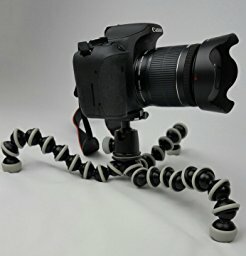 Introducing the “GorillaPod“, an extremely versatile and flexible option that can be adjusted to fit almost any situation. Rather than having stiff legs, these gorillapods feature fully articulated ball joints that can be moved to allow stabilization in any surface. What’s even cooler is that the arms can wrap around anything, allowing you to do things like hang your camera from a tree! Joby manufactures a very large line of gorilla pods in just about every size to fit your needs, compatible with both DSLRs and phones. Many famous vloggers like Casey Neistat even like to hold the ball part to use it almost like a selfie-stick. Monopod or Tripod For Make-up Gurus? If you’re looking into becoming a beauty YouTuber, the choice is clearly a tripod. You’ll be shooting yourself more than anything, and that means you’ll need to have your camera set up away from your face. Typcially a lot of beauty YouTubers like to vlog from their desks, which brings us to the Mini Desk Tripod by Manfrotto. This tripod fits on your desk, is less than $20, and has nearly flawless reviews on amazon. This little stand is incredibly rigid, portable, and is pretty much the only choice if you need to have your camera low to the ground for other purposes. It’s strong enough to support any DSLR and will fit perfectly on your desk so you can talk into the camera! If you pay a little more, it even includes a bonus adapter so that it will be compatible with smartphones if you are recording your videos with your smartphone (which is not a bad idea considering the video quality of some of the new phones). Monopod vs Tripod For Filmmakers? Yeah, good luck supporting that with a monopod. If you’re interested in being a filmmaker, there is no substitute to a proper tripod. When you start to get into indie films with an actual budget, you’ll notice that the cameras and accessories start to become huge. You’ll always need at least a Tripod, and in some cases, multiple tripods to support a larger device like a slider. That’s only the tip of the iceberg. If you try to shoot some of your student/indie film on a monopod, unless the shot is 1-2 seconds, you’ll notice that the shot looks very out of place and jarring. Documentaries may be a special case, but in narrative films you want to keep all of the camera movement smooth and natural. The audience should not be aware of the cameras presence. This effect is very difficult to maintain with a monopod. It is possible, but not with any sort of consistency, as the movement will be reliant on your ability to hold the monopod steady. Just stick with the tripod. If you’re looking for an excellent Tripod for your films at a good price, check out the Magnus VT-4000. It’s got everything you need right out of the box, and is extremely high quality for it’s relatively cheap price. The fluid head will help you get slick pans and tilts to make your film look professional! This category is a bit tricky. Some event coverage will require the usage of a tripod, while other events may need you to be able to run around and shoot on the fly. We think that if you’re looking into a career in event coverage, you’ll need to have both tools in your kit. This very unique Monopod was designed with agility in mind to be adjustable as quickly as possible. While most monopods utilize a locking system with multiple latches, the Manfrotto 685b has a pole that can be easily pulled downward to lock at any height. To release it, all you have to do is pull the trigger near the top and it collapses. This allows you to set up your Monopod extremely fast in quick situations like events or weddings. It’s the perfect Monopod if you value speed, and many reviewers have said they get twice as many shots as colleagues with other more difficult Monopods. Monopod Vs Tripod – What About For Photographers? 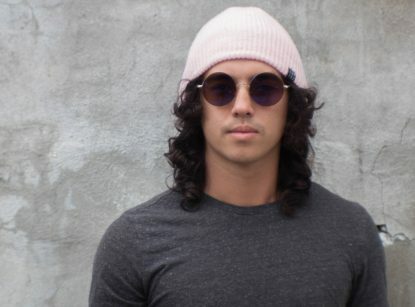 This website is definitely geared more towards video media, but if you are a photographer trying to figure out a stabilization solution, we’ve got you covered. This is the category we think most of you are going to fall into. If you are a portrait photographer, we recommend you stick to using Tripods. With the tight composition of portrait photographs, you’ll need to be able to set up your shot and position your subject before snapping the photo. Making changes to the lighting or pose of your subject will require your camera to remain stationary. Good portrait photographers are also good at interacting with the talent. This is made possible when you don’t need to be looking through the viewfinder of your camera. You can simply set up your shot, direct the model, and snap your photo! Sports photographers are capable of using both, but this category is actually dominated by Monopods! Monoods are quick and easy to reposition or adjust, especially in a hectic environment with subjects that are constantly moving. Whether its the NFL, or your children’s soccer game, the monopod is a much more reliable tool to capture the perfect moments. 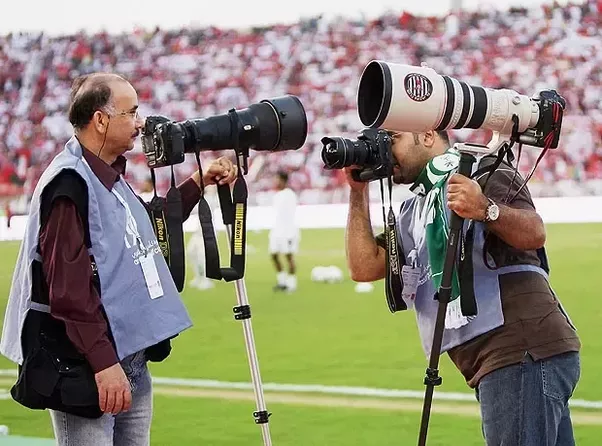 Monopods also excel at supporting long, heavier lenses like the ones you see in the photo above. Big sports games often have tons of photographers running around trying to capture the money shot, so you don’t want to be the guy getting in everyone’s way with your clunky tripod. If you’re a photographer that likes to hike through the wilderness to photograph animals in their natural habitat, a monopod is an excellent choice. Taking photos of wildlife usually means long treks through the wilderness. Tripods are large and heavy, and often times bringing one along on one of these journeys is simply not feasible. Some of your targets may also be moving very quickly, so an agile stabilization tool like a monopod will really shine here. We’ve actually got a great suggestion for this category. Manfrotto offers a very high quality pair of walking stick monopods at an affordable price. These sticks allow you to hike through the outdoors in comfort, while being convertible to regular monopods when you see a shot you’d like to take! However, if you happen to be shooting birds or other far-away scenery with large, long lenses, you might want to invest in a tripod. Same goes for if you are doing any planet-earth style macro level photography where you need absolute stability in a very small shooting space. While this field of outdoor photography is pretty similar to our wildlife/animal category, we think tripods are much more appropriate for shooting landscapes. Good landscape photos require a lot of attention to detail when it comes to framing and positioning. You will need to meticulously line up a shot before taking it, rather than point-and-shooting like you may do with animals. Bring a tripod along. Especially if you are going to be shooting in low light situations. we’ll talk more about that now. 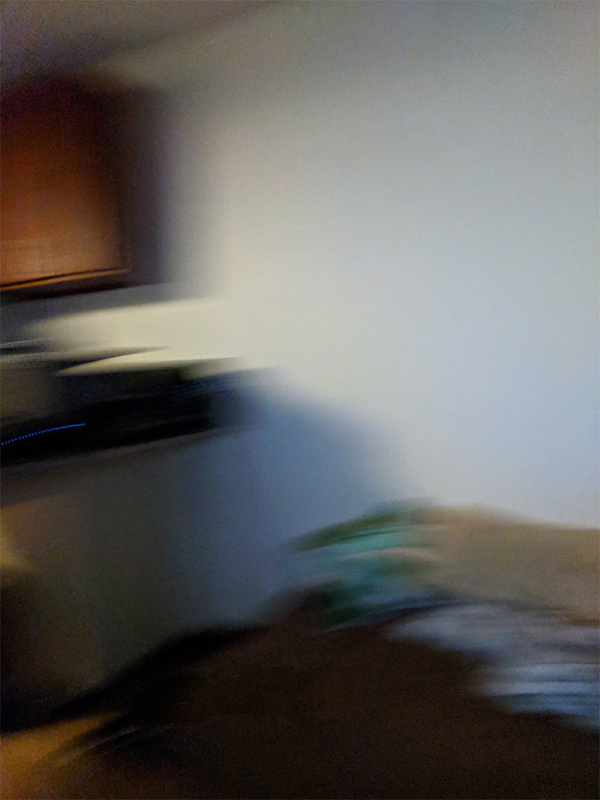 This is a photo of my living room demonstrating what happens if your hand even slightly moves while taking a low light photo. These are two types of photography that will allow me to give you a really simple answer. For night time or time-lapse photography, you will definitely need to use a tripod instead of a monopod. Night time or similar low light photography situations are heavily prone to motion blur if there is even the slightest movement of your camera. For this reason, you’ll need a stabilization solution that is not dependent on your hands, so we advise you stick with a tripod. Time-Lapse photography also will have this stipulation for obvious reasons. Time-Lapses require the camera to be kept in an identical position while a series of photos are taken over time. The slightest adjustment of the camera during a time-lapse will throw off the whole thing. You won’t be able to do this with a Monopod unless you’ve been turned into stone. In conclusion, the answer to your Monopod Vs Tripod curiosity is highly dependent on your personal needs. Like we say about most things we compare, they are both excellent tools for different situations and any ultimate FilmToolKit will have both of them. Hopefully this guide helped you discover which one is the best for you! You might have noticed we suggested several monopod products from Manfrotto. We have not been paid by them outside of our normal Amazon Affiliates comission, but we recently did an in-depth guide to most of Manfrotto’s product line, and we were very impressed with the performance of many of their monopods and tripods. Check out that guide if you’d like to see some more detailed offerings.